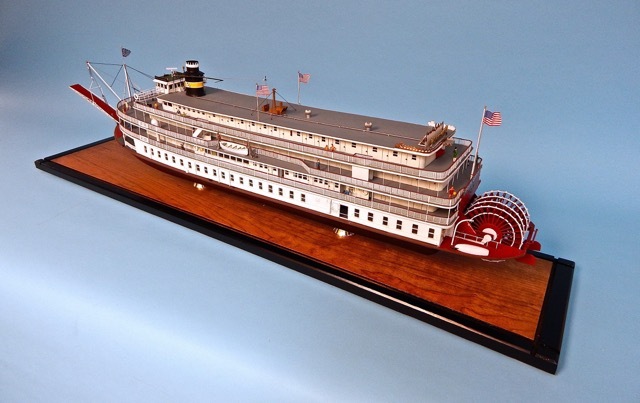 John Fryant is assisting in the restoration of a number of rare paddlewheel boat models that are held in the Cincinnati Museum History Library and Archive. 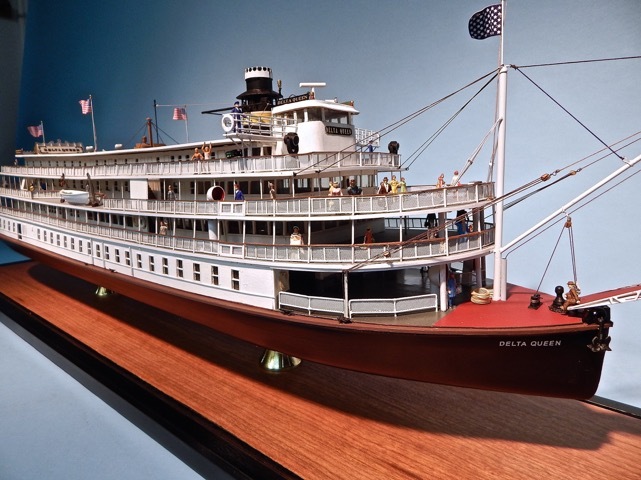 He has just completed the first model, the Delta Queen Steamboat. The date and maker of the model is unknown, but it is of excellent quality, and now completely restored, it has a new life. 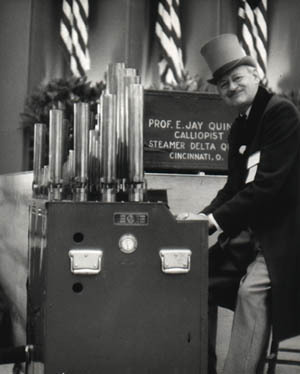 I've just completed the restoration of the DQ model owned by the Cincinnati Historical Society. Am sending photos - two at a time. It turned out very well. I've put some photos on Facebook. When I got the model in the shop I discovered that all the railings wee so fragile that they wouldn't have stood up during the refurb process. So I replaced all of them with new laser-cut stanchions backed with aluminium micro screen and capped with plastic strip. 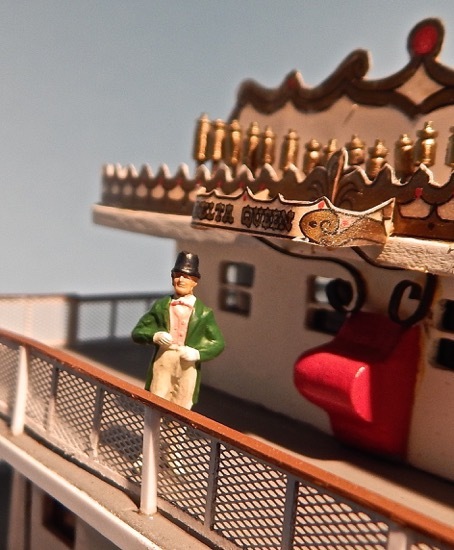 Other parts were replaced - the forward derrick and boom and the stern flagstaff were newly made from soldered brass. 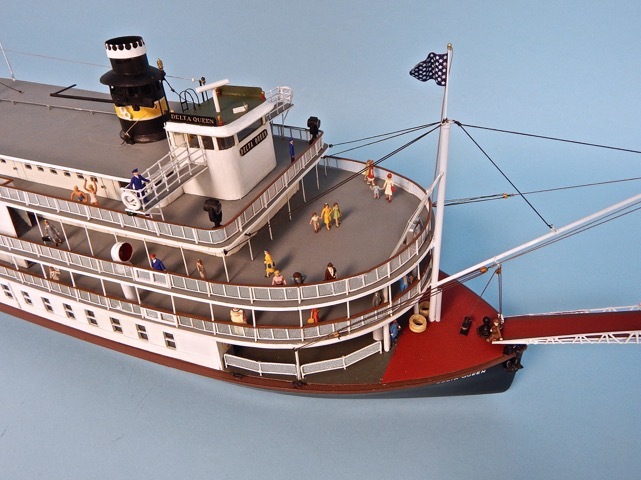 Everything was repainted except for the boiler and texas deck bulkheads and the sternwheel. I did paint the white circles on the wheel as most folks remember her that way. The base with the green Astro-Turf was a mess. After cutting off the green mess I discovered that the model was fastened to the base with two big wood screws. Whoever built the model had evidently built the hull and then installed the screws and built the superstructure around them. There was no way I could unscrew them without destroying the model. So I hack-sawed through them. When the model was removed I discovered a business card from Jim Cissell, a Cincinnati councilman. On the back was a 1975 Bengals football schedule. Thats the only information I have which might possibly date the model. Looking into the engineroom I discovered a small electric motor and gear reduction unit that once turned the paddlewheel. 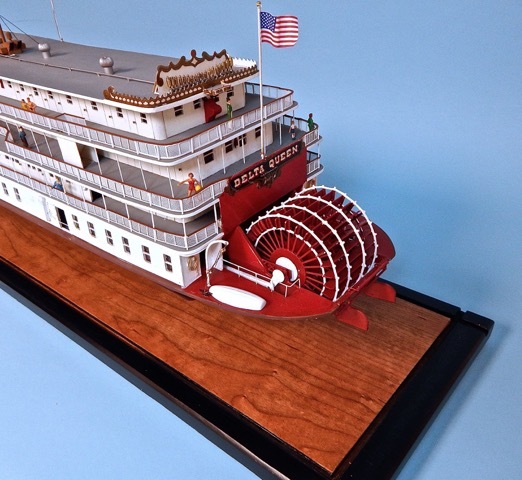 The model is built entirely from balsa wood and is light enough to have been floated. Was it ever in the water? Or was it radio controlled? We will probably never know unless the builder can be found. 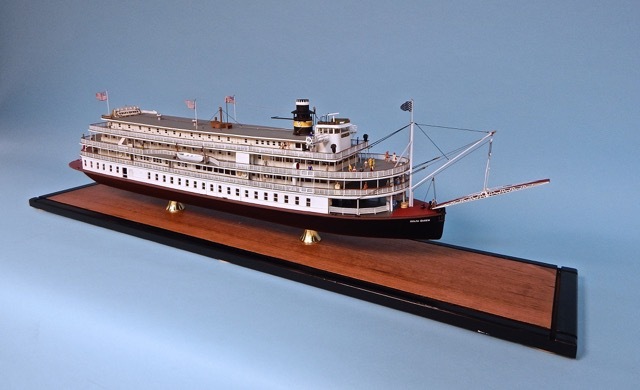 It looks much like the work of the late Charles Cason of Newport, KY who built many very accurate steamboat models. But I don't know that he ever built an operating R/C model. 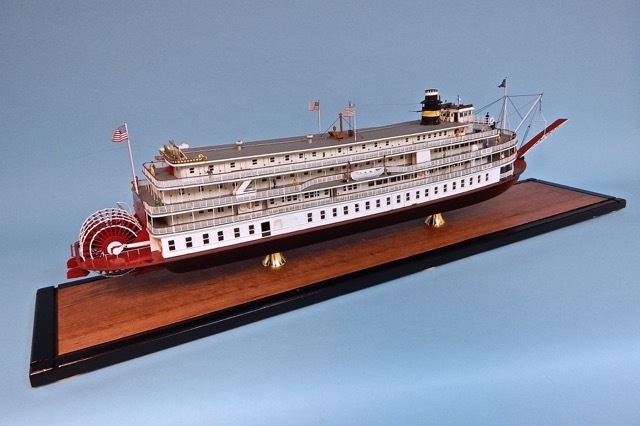 John Weise examined the model and pronounced that it was not the work of his father, Lester. The wood base was covered with cherry veneer and came out very nice. I will be delivering the model back to the CHS on Friday morning. Editor's note: great work, John, and there is a slight resemblance there! This is the "before" shot of the model.